I’m continuing to take the animals from my Arabic Alphabet Animal poster and turn them into coloring sheets for the upcoming book. Here is the first letter of the alphabet: Alif, represented by Amira the Arrnab (Rabbit). Please subscribe to A Crafty Arab newsletter to get the first three animals from the coloring book for free. In Egypt, the Monday following Easter Sunday is a national holiday. This uniquely Egyptian holiday is thought to date back to the time of ancient Egypt, and seems to have been celebrated throughout the Greek, Roman, Coptic and Muslim periods of Egyptian history. 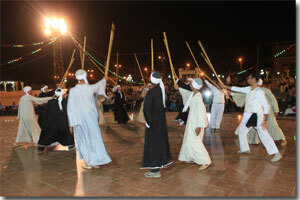 Shamm el-Nessim’s picnic festivals include tahtib, or stick dances, in which two men perform a ritualized and highly skilled mock battle in slow motion with wooden poles over seven feet long. Each dancer must attempt to strike a blow (gently, since the aim is to score points, not to injure) while maintain his own balance and moving in time to the music of the drums and flutes. As the tempo of the music increases, the dance becomes more and more exciting. 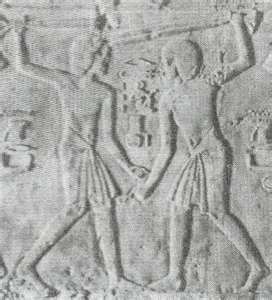 Scenes of stick dancers have been found inscribed in walls of tombs and temples of ancient Egypt. Beautifully dressed dancing Arabian horses also perform, and every family plays favorite games as well. The traditional foods of Shamm el-Nessim have their own meanings. 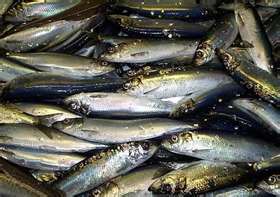 Feseekh, a salted dried fish, is claimed by historians to have been introduced by the ancient Egyptians, who understood that unsalted fresh fish would quickly point and cause illness to those who ate it. Hard-boiled colored eggs, like our Easter eggs, represented the origin of creation to the ancient Egyptians, Greeks and Romans. Eating them on Sham el-Nessim is considered lucky. Some things for you to try: Experiment with dyeing hard-boiled eggs with natural colors, as the ancient Egyptians did. The eggs should not be boiled in an aluminum pot, or the dye will not take. Try the following foods and juices: tea, red onion skins (brown, red-brown, orange), beet juice (red), turmeric (yellow), and leaves of fresh anise or dill week (green). Boil the leaves or juices until the color permeates the water; dip the eggs in, and leave them until they are the shade you want. Be sure to wear old clothes for this project, since these dyes are permanent. Plan a Sham el-Nessim picnic for your class. Make a complete menu for your picnic basket and plan what games you would like to play. Fisseekh is not available in the Unites States, so you might want to substitute sardines or albacore tuna instead. Arab pocket bread is available in many large cities. In any case, be sure your meal is balanced with a protein food (the eggs can do for this), green vegetable and fruit, and bread. Mint tea is the customary beverage (you may wish to have fruit juice instead).